Does your company produce deep-fried products? Just forget the need for titration to determine acidity in frying oil! You can now monitor the degradation of oil you’re using with the CDR FoodLab® analysis system, in an extremely simple and fast way, right in the production plant. Thanks to CDR FoodLab®, you can obtain reliable results in real time directly at the production plant and be able to take promptly key decisions. Solutions for frying oil analysis was last modified: September 11th, 2018 by CDR s.r.l. With CDR FoodLab®, it becomes possible to determine the shelf life of deep-fried products (e.g. snacks) by regularly monitoring the oxidation state and the rancidity of the oils contained in the different products. The CDR FoodLab® chemical analysis system to determine the degradation of deep-frying oil and the shelf life of snacks and fried products can also be used to test any type of vegetable and animal fats and oils. Moreover, it can be configured to perform chemical analyses on eggs and egg products, milk and dairy products, tomato and tomato derivatives. It is easy to use: you do not need a dedicated laboratory or skilled personnel with previous specific lab tech experience. Results are obtained in just a few minutes and are correlated with the ISO reference methods. The sample is tested as is, or with a prior extremely simple preparation. It is free of maintenance or assistance costs. No calibration procedure is required. 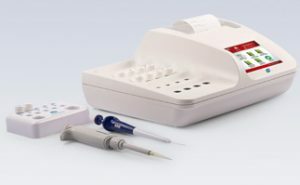 Reagents come in disposable pre-filled vials, thus removing the need to handle carcinogenic substances. There is no need to wash either containers, accessories or traditional glassware. No costly equipment (e.g. quartz cuvettes) is required. CDR FoodLab® is the ideal solution to monitor the quality or the progressive degradation of deep-frying oil, providing accurate data on the oxidation of oil at a given moment. 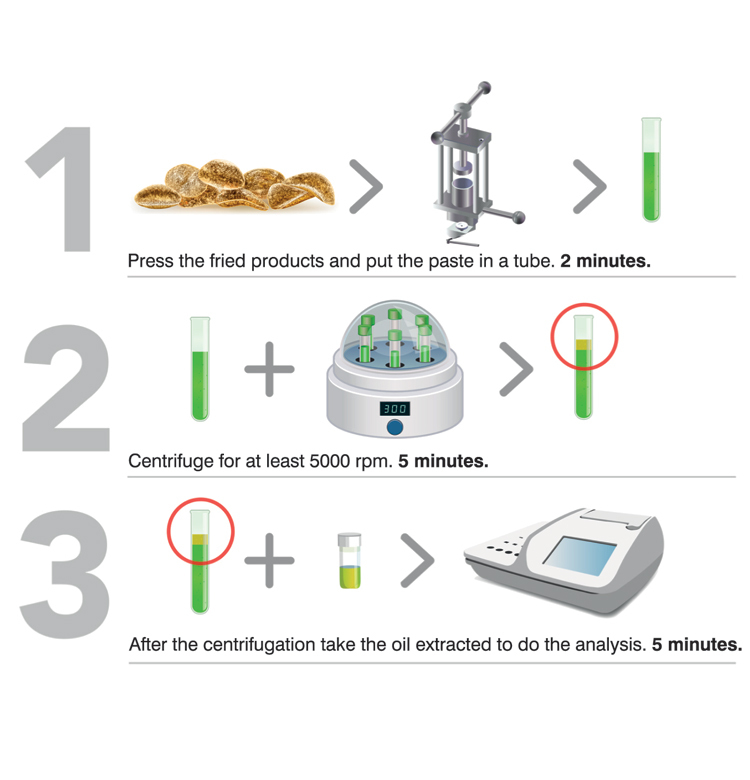 Moreover, the system allows to perform an utmost accurate analysis of an oil thanks to the p-Anisidine Value test, which is the parameter indicating the secondary stage of oxidation. The TOTOX value is calculated by the formula: p-Anisidine + 2 Peroxides. This allows to determine the whole oxidation story of an oil and, therefore, its overall degradation state. The figure shows the trend of the three parameters over time and the relation between their respective values. The TOTOX value is the parameter calculated combining the peroxide value and the p-anisidine value and reveals the whole oxidation state of an oil. Source: “Oxidation of food grade oils”. CDR Foodlab is the new and fine tuned version of FoodlabFat. Both systems share the same innovative analytical method, notably the CDR FoodLab® method, which was used for a test to determine the p-Anisidine Value in two types of sunflower oils for a comparative study on the oxidative stability of deep-frying oils carried out by the University of Hamburg: “Analyses of the oxidative stability of deep-frying oils”, curated by Katharina D. Placke, Jan Fritsche and Kim K. Kleeberg. Researchers relied on our instrument to determine the quantity of p-Anisidine, which provides a sound indication of deep-frying oil resistance. The study highlighted the reduced testing time, the intuitive method of the system, the fact that titration is not required and, therefore, that toxic reagents are not employed.